Bone marrow is a spongy tissue found inside bones. Bone marrow contains stem cells which are capable of transforming into cartilage bone, blood cells, and platelets. As stem cells can transform and grow into different types of cells, bone marrow can be transplanted from one person to another. Two types of bone marrow are present in human being – red marrow and yellow marrow. The basic function of bone marrow is to produce new blood cells. Disorders of bone marrow may lead to a number of diseases including cancer. Cancers of the bone marrow are classified into different kinds depending on the affectation of neoplasm. There are a number of treatments for bone marrow cancer, one of which is Bone Marrow Transplantation. In this process, bone marrow is taken from living donors whose body cells match that of the recipient's. The process is termed bone marrow harvest. Usually, bone marrow is harvested from the donor's hip bone under general anaesthesia. The required amount of marrow is collected by inserting a needle into the rear hip bone's cavity. 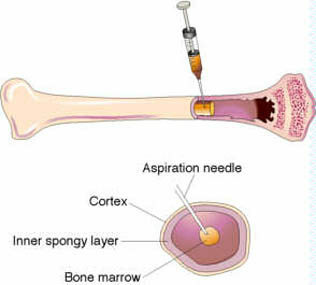 The procedure is repeated several times in order to collect the required amount of marrow. As the hip bone contains large quantity of marrow, it is the right bone to collect the desired fluid. Normally, the donor experiences slight discomfort, but the risk involved in negligible. After the affected bone marrow of the patient is destroyed by radiation or chemotherapy, the healthy marrow collected from the donor is infused into the patient's blood. This new marrow reaches the cavities of large bones and starts producing new blood cells. There are many complications that might arise from transplantation of bone marrow. Important among them are explained below. A critical complication is the lack of engraftment. This means the transplanted stem cells fail to grow with in the receiver's body. In this case, the transplantation is considered a failure. Another major complication that may occur at the early stages of recovery is Graft Versus Host Disease (GVHD). This is because receiver's immunity defence mechanism attacks transplanted marrow cells. To overcome this, patient is administered immunosuppressant medicines before the transplant. GVHD is curable but in extreme conditions, this can be life threatening. Another probable complication is Veno-occlusive Disease which involves the kidney or the liver wherein build up of dead cells block the blood vessels of kidney or liver. Other minor complications are bleeding and infection, which can easily be controlled with suitable drugs. How Well a Patient Survives Bone Marrow Transplant? The survival rate of bone marrow transplant patients depends on various factors. Usually factors such as the quality of treatment given, patient's mental and psychological condition and precautions taken after the transplant decide the bone marrow transplant survival rate. Studies have shown that it is anywhere between 70% and 98%. The high survival rate can be attributed to factors such as the type of transplant; degree of matching between the donor's and recipient's cells, patient's age and health condition or the patient's genes. Bone marrow transplantation survival rate is also attributed to reasons like type of chemotherapy received before the transplant and most importantly improved quality of anti-rejection medicines that are available now.